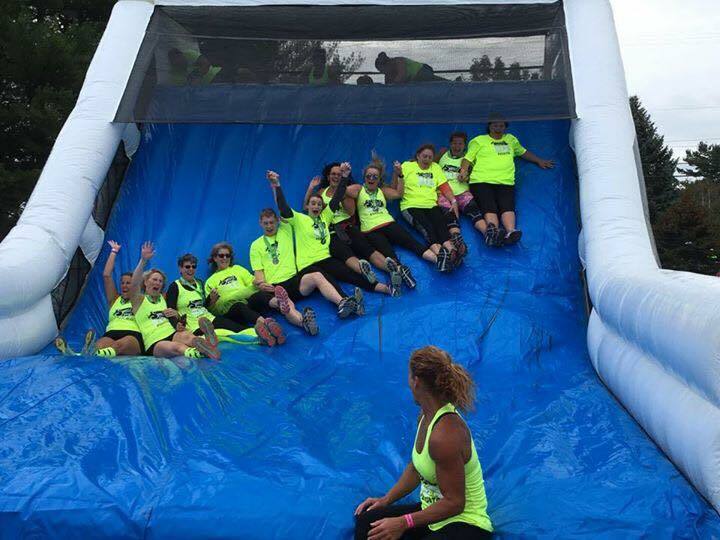 Almost three years ago, I got a text message from my big sister asking me if I could train her and her friend to get ready for a Tough Mudder, a 12 mile obstacle course that they admittedly were a little afraid to do. She asked if, at 5:30am two times a week, I could put them through the ringer. I was all on board except for the 5:30am part, but because I love my sister SO MUCH, I said of course. And just like that, a week later, the first "official" Hybrid Fitness workout would take place. 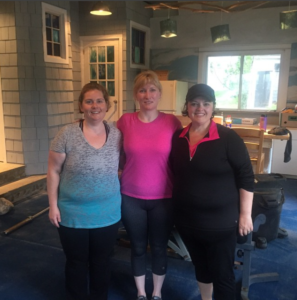 There were four of us in a super small room that I had bartered for as our temporary gym. If I weed wacked my friend Sherry's lawn, then I could use the space! It was a pretty sweet gig. I used my lawn mowing money to purchase new equipment, and moved what I had from my parents garage here as well. (I had been stockpiling equipment for years). 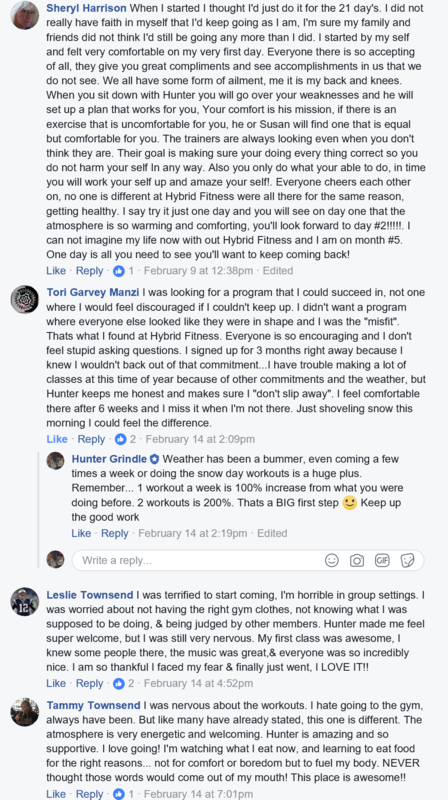 After two weeks of my early morning workouts, my sister Torey and her friend Michelle came up to me and told me something that would change how I thought about gyms and working out forever. 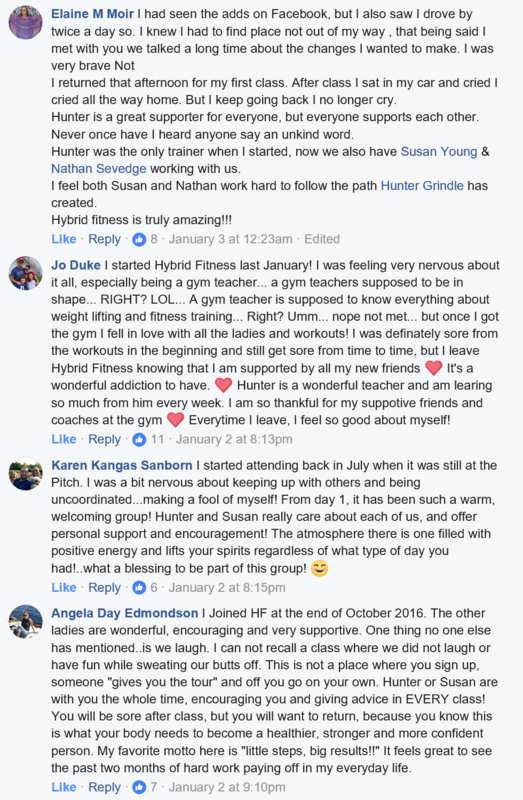 They told me, "Hunter, we've also been working out at another class while working with you. Our other class is great, and we love the instructor. However, it's like an episode of mean girls. We get looks, and nobody really talks to us. When we are here with you, we don't feel like we're being judged. We can just be ourselves." I didn't realize that that happened in workout classes. Me always being a decent athlete in high school, I never really felt out of place. But if that happened to me, or if I even heard about that happening, then I definitely wouldn't want to work out at a gym! It opened my eyes to all of the men and women being left out. I'm sure they were afraid of the exact same thing that Torey and Michelle had experienced - Cliques and Drama. And we thought we graduated high school! It felt like a calling for me, and I knew I wanted to help those people who needed it most. 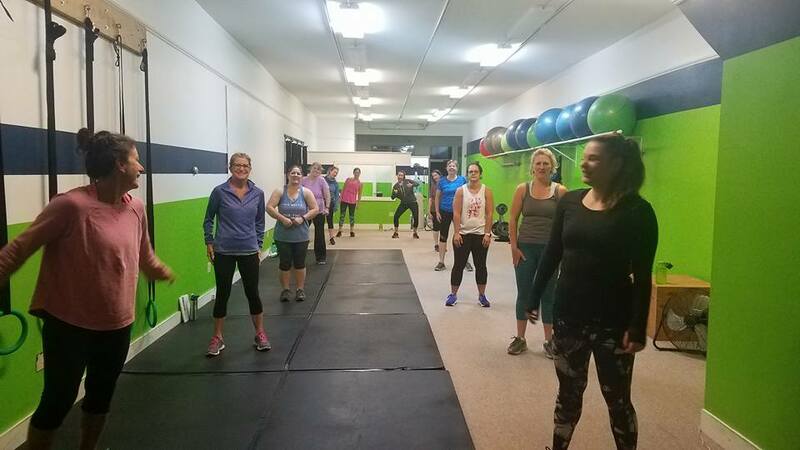 Slowly but surely, we started to grow our classes... and 3 years later, we've impacted 500 men and women through our workout classes in our fun, judgement-free setting. This all takes place at our gym on Thomaston Main Street. Don't they all look a little too happy for a 5AM class?! People come and see us for a number of reasons. They have fitness goals, and we have great workouts that produce amazing results. We are very proud of that. Other people come for reasons other than just getting in shape. Sometimes people have life changes that can put them in a dark place. We take the time to sit down with every one of our members in a Strategy Session before they start, so we can hear your full story. Not everyone tells us everything in the beginning - and we aren't pushy. Sometimes its not until a few months down the road that we hear about the real reasons people come. Being able to help those who are going through a tough time has been such a gift to me, and I couldn't do it alone. 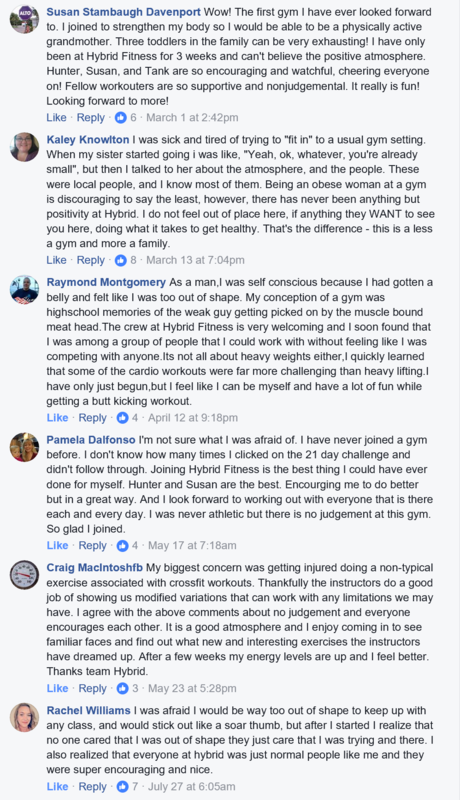 We have such an amazing team of trainers and staff here at Hybrid Fitness who have the biggest hearts, and care for people so much. That's exactly why I wanted them to join the team. No matter who you work with here, you will be in great hands. Recently, as our gym as grown, my role has changed from helping people directly to teaching and managing our staff. This change has had an effect on me, also sometimes bring me to a dark place. 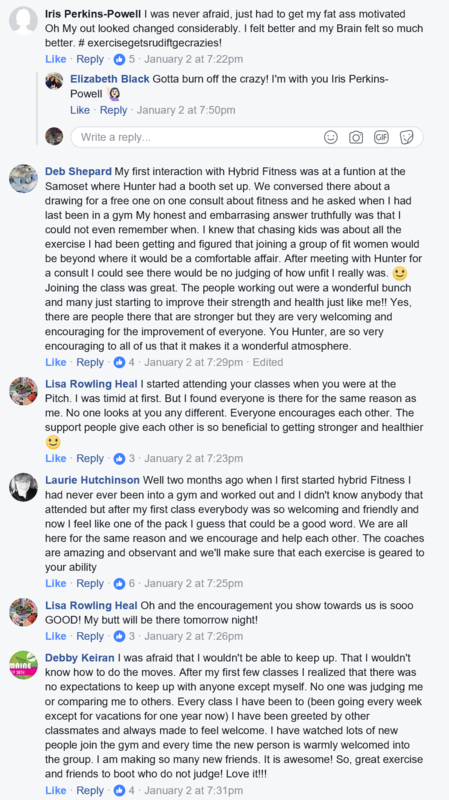 What made me so happy in the past, coaching our members, doesn't happen as often now. Although I love being a coach to our trainers and "running the business", it's not quite as fulfilling. But, I have made this role change because I will always do what I believe is best for our gym - and also myself. 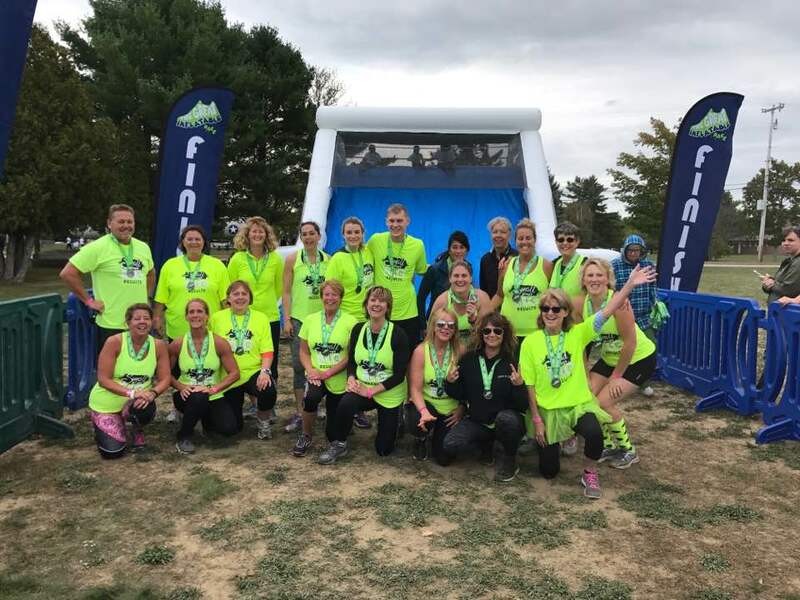 This past weekend, our gym entered the inflatable 5k. Being around all of the positive energy from members picked me up, and reminded me of why I do this. In fact, I hate calling them members. They are truly my friends. Those same people who I have sat down with to dig deep into their goals and problems, rose ME up. It goes back to something we've always preached here. No matter what your goal is - you need a team. You need people who can keep you going even when things get tough. 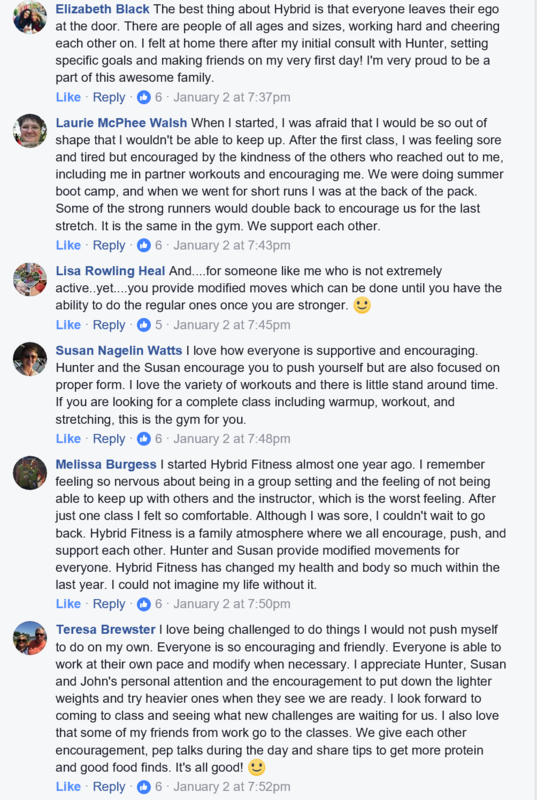 And this weekend I realized what changes need to happen for myself and for Hybrid Fitness so that we can continue to positively impact peoples' lives. Probably the LEAST important thing about Hybrid Fitness are the workouts. It's the Positive Energy. Its how great the people make you feel. It's the feeling of knowing you are cared for and that someone always has your back. We are constantly evolving here... and now we are going to take things to a whole new level. 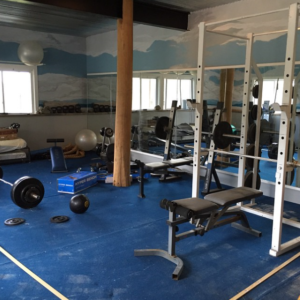 Many of our members call the gym their second family. So it's time we started acting like one. All families have family gatherings - so that's what were going to do. Around the holidays, we'll throw parties! If there aren't holidays, we'll find something to celebrate! We'll drink wine and do paint nights. We'll dress up dorky and do ridiculous exercises. We'll have field trips to exotic destinations. Come party with us - meet with me and the team, and we will give you the happiest gym experience you will ever have. P.S. 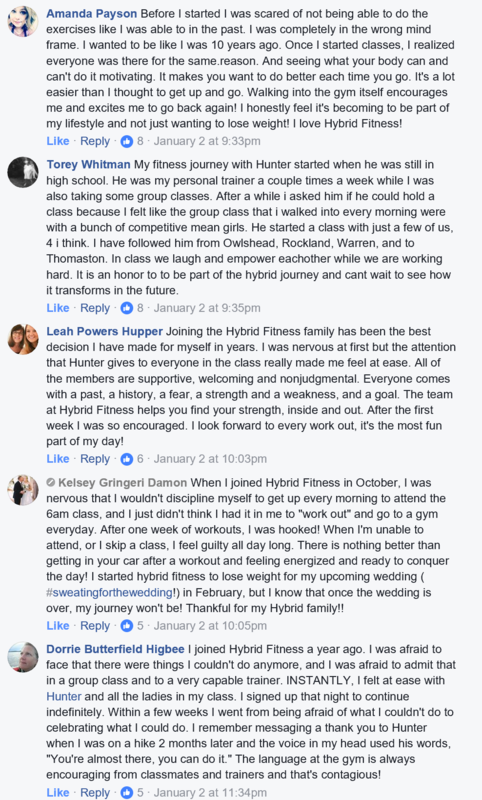 Below are what some of my friends have said about why they love Hybrid Fitness. P.P.S. 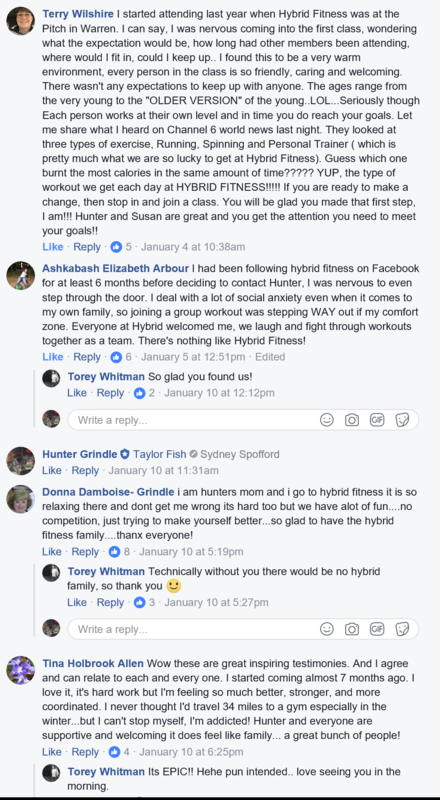 If you love Hybrid Fitness - share this post with your friends! Setup Your Free Strategy Session!